Tilda Swinton's hypnotic voiceover and a treasure trove of rare archival footage culled from hundreds of films from the 1880s through the 1930s—much of it previously unseen—combine to trace the anxieties of today's hyper-connected world back a hundred years. Then, too, electric media sparked idealism in the public imagination—hailed as the beginning of an era of total communication, annihilation of distance and the end of war. But then, too, fears over the erosion of privacy, security, morality proved to be well-founded. DREAMS REWIRED traces contemporary appetites and anxieties back to the birth of the telephone, television and cinema. At the time, early electric media were as revolutionary as social media are now. The technologies were expected to serve everyone, not just the elite classes. Human relationships would become stronger, efficiency would increase and the society would be revolutionized... But these initial promises were very different from what new media eventually brought to daily life. 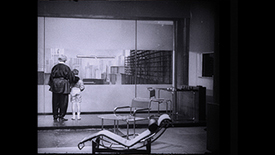 Using excerpts from early dramatic films, slapstick comedies, political newsreels, advertisements and recordings of scientific experiments culled during years of research in film archives around the world, co-directors Manu Luksch, Martin Reinhart and Thomas Tode unearth material that is by turns hilarious, revelatory, beautiful and prescient. The archival footage, combined with poetic narration and a virtuosic score by Siegfried Friedrich forges a cross-generational connection between contemporary viewers and their idealistic forbearers of a century ago. Beyond Zero: 1914-1918: Auteur filmmaker Bill Morrison brings to life a new cinematic record of World War I.
Cycling the Frame: A quirky 1988 documentary in which Tilda Swinton tours the circumference of the Berlin Wall on a bicycle.